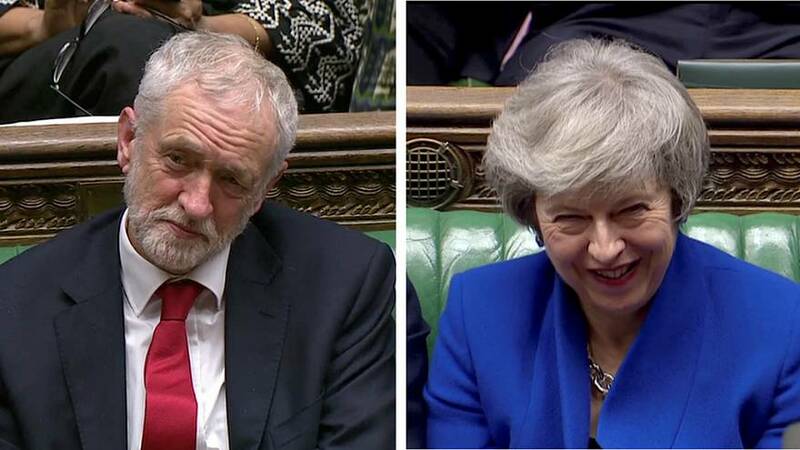 A heated discussion ensued between UK Prime Minister Theresa May and Labour leader Jeremy Corbyn on Thursday afternoon as the political rivals faced off via letter over their differences on the next steps towards securing a Brexit deal. Corbyn started the exchange, first by sending a letter to his fellow party members in which he celebrated the historic defeat of his opponent several evenings before when parliament voted overwhelmingly to reject May's deal. "This week we defeated the Tories' EU withdrawal deal by inflicting the biggest loss on any sitting government, and I write to thank you for your support and unity," he wrote. Corbyn then asked his party to give the government the silent treatment until it could promise that a 'no deal' Brexit scenario could be ruled out. "The prime minister has offered to open talks with opposition parties, however, I have been absolutely clear that any starting point for talks about breaking the Brexit deadlock must be on the provision that the threat of a disastrous 'no deal' outcome is ruled out," he said. Pointing to the example set by other party leaders as a reason to follow the request, he added: "This is a position that has now been adopted by the First Minister of Scotland, Nicola Sturgeon." "I urge colleagues to respect that condition and refrain from engagement with the government until 'no deal' is taken off the table." Corbyn then turned his attention directly to May, outlining the same points he made in his letter to the Labour party, and warning that entering talks at such at a late stage with a 'no deal' scenario still in play, would be a "reckless leap in the dark." He concluded his letter with pitching Labour's alternative plan for Brexit, including a single market deal and a UK-EU customs union — something May has repeatedly ruled out. "I am disappointed that there have already been several briefings in which you continue to rule out a customs union," he wrote. "A new customs union is part of a solution favoured by most businesses and trade unions, and one that I believe could command a majority in the House of Commons." "I look forward to receiving your reply." Theresa May was quick to hit back in her response, expressing immediately her disappointment in Corbyn's refusal to meet. But similar to Corbyn in his letter to Labour, May then pointed to the actions of other parliamentary leaders, such as the SNP, as an example to follow. "I am pleased that all the other parliamentary leaders of the other parties -- the SNP, the DUP, the Liberal Democrats, Plaid Cymru and the Green Party -- agreed to meet without preconditions," she wrote. However, as Jeremy Corbyn noted in his letter, the SNP hasn't publicly agreed to talk without preconditions. A letter from SNP parliamentary leader Ian Blackford on Wednesday said the party could not participate in talks without several conditions being met. "It is my view that if you are able to confirm the extension of Article 50, a ruling out of a no deal Brexit and the option of a second EU referendum would form the basis of those discussions, then we could participate in them," he wrote. Blackford's letter was later reinforced by a tweet on Thursday from Nicola Sturgeon, who said: "Rule out no deal, be prepared to extend Article 50 and agree to at least consider another referendum - then we'll talk." In her letter, the prime minister searched for some common ground between herself and her opposition, highlighting that neither wanted to see the UK crash out of the EU without a deal. However, she maintained that ruling out a no deal scenario was not possible. "Let me explain why," she said. Laying out two options, May said a no deal scenario could only be avoided if parliament were to agree on some sort of deal or revoke Article 50 and remain in the EU. "I believe it would be wrong to overturn the referendum result," she added. "So the purpose of the discussions I have been having with other party leaders and MPs is to understand and explore the issues that are standing in the way of parliament being able to reach a consensus in support of an agreement with the EU, which would avoid a no deal outcome." Questioning Corbyn's request to refrain from talks, May said: "Do you really believe that, as well as declining to meet for talks yourself, it is right to ask your MPs not to seek a solution with the government?" Despite the objection to Corbyn's request, May concluded with an appeal to her rival's judgement, saying her door remained open to a meeting. "So that we, as prime minister and leader of the opposition, can talk and see if we can begin to find a way forward for our country on Brexit." "I sincerely urge you to accept." Corbyn has yet to respond.